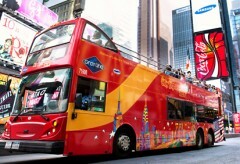 The Official Site of New York CitySightseeing Bus and Boat Tours! Explore Uptown and Downtown Manhattan and Brooklyn with our all-inclusive 2-day double-decker tour. Four unique bus loops and a ferry tour feature iconic sights and the freedom to hop on and off at your leisure. Includes FREE CitySightseeing New York© Hop-on, Hop-off Ferry Tour! The best of the Big Apple all on one convenient ticket! Sit back and relax as our knowledgeable tour guides walk you through the history and background of 4 of New York City’s most spectacular neighborhoods – Downtown Manhattan, Uptown Manhattan, and Brooklyn! With must-see attractions like Times Square, the Brooklyn Bridge, Central Park, the Guggenheim Museum, and more, you’re sure to get the full New York City experience, all from the comfort of a double-decker bus. Plus, unlimited Hop-on Hop-off access means you can take your time exploring as many of the neighborhoods and sites as you’d like. No need for cabs or the subway – this bus pass is a tour and transportation all in one! All ticket purchases also include exclusive content in the TimeLooper virtual reality mobile app available for Apple and Android mobile smartphones. Watch the city transform right before your very eyes as you to travel through space and time to relive historical events that took place at major New York city landmarks! Witness the famous V-J Day Kiss in Times Square in 1945, watch the Sky Boys enjoy lunch from a hanging beam atop the Rockefeller Center in 1932 and even check out Federal Hall in 1789 during George Washington’s inaugural! Be fully immersed in the TimeLooper experience and step inside history with the TimeLooper Virtual Reality Cardboard headset. • The BEST value package for 2-day NYC bus tour sightseeing! • Unlimited hop-on hop-off access throughout Manhattan and Brooklyn– a $280 value! • FREE Night Tour included – enjoy stunning views of the city lights. • FREE exclusive app content to travel back in time and experience iconic NYC landmarks with the Timelooper Virtual Reality App. • FREE additional tours, attractions, discounts and more – included with your pass! 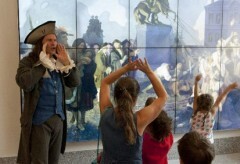 *The Free Museum ticket is only valid for entrance to the Museum of the City of New York OR New York Historical Society. All Around Town 72 Hour Tour - Add another 24 hours to the All Around Town 48 Hour ticket. Choose this option if you have an additional day to experience more tour stops! All Around Town 48 Hour Tour + 1 Attraction: This option includes all loops included in the 48 Hour Tour AND your choice of admission to any one attraction from our selection of New York's most popular attractions. This is a great combo ticket if you plan on visiting any museum or attraction during your trip! All Around Town 72 Hour Tour + 1 Attraction: This option adds an additional day to the All Around Town 48 Hour ticket, and also adds an attraction ticket to your itinerary. Choose from our selection of New York's most popular attractions. This is a great combo ticket if you plan on visiting a museum or attraction during your trip, and also want to access the hop-on, hop-off bus tour for an additional day. FreeStyle Pass 3 - The FreeStyle 3 Pass is the easiest and most convenient way to see New York City. This pass Includes the All Around Town 72 Hour Tour AND your choice of admission to any 3 attractions – choose from New York City’s most popular attractions. This is a great combo package if you plan on visiting several museums and attractions along with your hop-on, hop-off bus tour. Our travelers can save more than 40% compared to buying these tickets individually! Tour lengths vary based on the route and range between 90 minutes and 3 hours. Locations vary by tour. Please refer to each tour description under “ticket includes” for specific locations. Times vary by tour loop. Please refer to each tour description under “ticket includes” for specific times. Buses run continuously every 25-30 minutes. Once you've completed your online purchased, you will be instantly redirected to a page with your live ticket. Just take a screenshot of the QR code and store it in your phone. * This live ticket can be used immediately to board the bus at any designated hop-on stop along the route. No need to travel across town to begin your tour at a specific or less convenient location. Once the driver scans your ticket the first time, your tour is officially underway! Please see the Routes Tab above for a complete list of stops. *You can also print your ticket if you prefer. State Street, between Bridge and Pearl Street, by Battery Park. 2 Hours (bus only. Does not include time spent at hop-off locations). Pass valid for 1 day. After your online purchase you will be redirected to a page with your voucher. An order confirmation, with a link to your online voucher, will also be e-mailed to you within two hours of completing your purchase. Simply show the voucher on your mobile phone or bring a printed copy to any of the departure locations to board the ferry. 777 8th Avenue between 47th and 48th street. *Please note, the Night Tour will not operate on 9/18 or 9/19. 15. United Nations - Corner of 45th St. & 1st Ave. Please reference our brochure map for the latest stops and sights. What happens after I make my purchase? After you complete your online purchase, you will be redirected to a page with your live ticket. Additionally, an order confirmation with a link to this ticket will be emailed to you within two hours. Simply print or take a picture of the QR code on the ticket and you’re ready to board the bus at any designated stop! The driver will scan your ticket each time you hop on. How long do I have to use my pass? Our All Around Town 48 Hour Tour is valid for 48 hours. A 2-day/48-hour pass is valid for 48 consecutive hours from the time your ticket is scanned on the bus. What does unlimited hop-on, hop-off access mean? Can I get off anywhere? With unlimited hop-on, hop-off access you can hop off the bus at any of the designated tour stops along the route, spend time walking around or exploring attractions, and get back on the bus at the same stop or any of the other designated stops listed on our map. You can do this an unlimited number of times within the specified hours for each tour. For a full list of tour stops, view our map. You can not hop off at locations other than our designated hop-on, hop-off tour stops. Do I need to specify a date of travel? No. When you start your order, you will have to choose the day you believe you are going to use the voucher. However, we do understand that plans change so you have one year from the date of purchase to begin using your pass. After one year, it will expire. Please note, some of our partner attractions do require reservations, please refer to the tour details for more information. Can I use my pass to board the bus? YES! We have recently upgraded our technology, so you no longer have to redeem a voucher for a bus ticket at a visitor’s center. Your live ticket is delivered to you instantly. Just print or store it on your phone and the bus driver will scan it for immediate boarding. Where can I start the tour? You can begin the tour at any designated stop along the bus route! The bus driver will simply scan your live ticket and you’ll be on your way. Is the tour commentary available in my language? We have a live guide providing commentary in English on all of our bus tours. Recorded commentary is also available in: English, Spanish, French, German, Italian, Hebrew, Portuguese, Mandarin Chinese, Korean and Russian. What time do buses start and stop? How long does the tour take? Your tour length varies based on the route. We have 5 double-decker bus routes. If you’ve selected an All Around Town pass, you’ll also have access to the CitySightseeing Hop-On, Hop-Off Ferry. The times, listed below, do not include optional time spent off the tour bus at hop-off locations. How long will I have to wait for the next bus? Our double-decker buses run every 15-30 minutes. Please be advised that times can vary due to New York City traffic, particularly during rush hour. What is the Timelooper App? TimeLooper is a mobile app that lets you travel back in time using your smartphone and cutting edge augmented and virtual reality technologies. Visitors not only see the sites as they are today, but also re-live the moments that made them memorable. How does the Timelooper App work? When you redeem you voucher, you will receive your Member ID with your sightseeing receipt. Simply download the Timelooper app on your mobile device. Select “New York” and then “Iconic Landmarks”. Tap “Membership” in top right corner. Enter your e-mail address and the “Member ID” with the voucher. Click “SEND” and you’re all set! Download videos and enjoy! Are your vehicles handicapped accessible? Yes. We have handicapped accessible vehicles available. We recommend that passengers requiring special assistance inform us at the time of reservation, and no later than 48 hours prior to departure. Please call 1-800-669-0051 for assistance. Darius was a great guide. We had a great time. I would recommend this to others. This is a great way to see the sights and get to the places you want to visit. The staff are very friendly and knowledgeable. Dan was an informative n funny guide We enjoyed his tour a lot. Was apprehensive about this tour but shouldn't have been. it's a 'must'. The tour guides Federico and Todd get a specific mention as they were respectively excellent - knowledgeable about locations and pleasant. In fact there wasn't a question Federico couldn't answer - impressive! Stops are good and well placed. Option to stay on a drop the circuit. Bought the two day package with extras of boat, brooklyn and bronx. Drivers are good. Good value. This ticket for the all around town buses was the best value for me. We were able to mix and match bus routes over the 2 days that we were touring in New York city. The buses came frequently and we covered more ground than I imagined we would. I would recommend this upgrade to include all of the routes instead of just purchasing a single route. Reviewed on 9/25/2015, By Yue L.
Good but can get busy at times. Reviewed on 9/21/2015, By Donald B. Great prices on NYC bus tours etc.! Reviewed on 9/15/2015, By Maria Ximena A. Reviewed on 9/11/2015, By Hillary B. Great way to see the sights in New York (as well as get around!) Can't wait to come back and go on another tour with you! You can upgrade to the Empire State Building Observatory for just $15 more? © 2017 CitySightSeeing NY. All Rights Reserved.